1. Asia will beat out both Europe and the U.S. in tablet sales. Asia-Pacific will see almost 39 million tablet sales next year. 2. 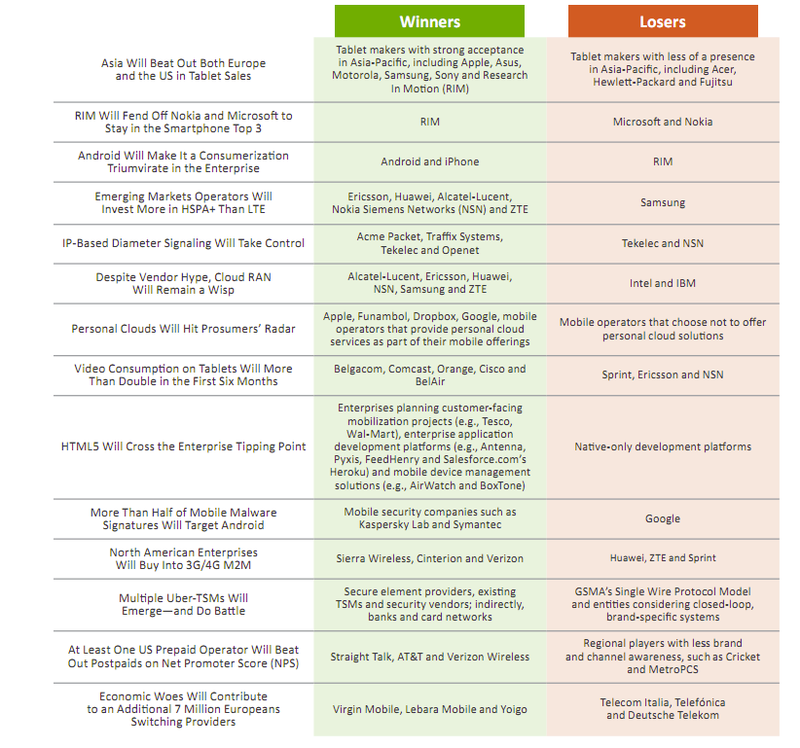 RIM will fend off Nokia/Microsoft to stay in the smartphone top 3. RIM smartphones will continue to account for more than 1 in 4 smartphones in U.S. enterprises and will remain in double digits with U.S. smartphone owners. 3. Android will make it a consumerization triumvirate in the enterprise. It will go from a third-place position to an even share alongside iPhone and BlackBerry. 4. Emerging markets operators will invest more in HSPA+ than LTE. They will embrace the chance to get headline speeds for a software upgrade, eschewing LTE for now. 5. IP-based Diameter signaling will take control. Spending in the segment will more than double, growing from U.S.$22 million to U.S.$45 million. 6. Despite vendor hype, cloud RAN will remain a wisp. Its requirement for extensive dark fiber runs will limit it to only a few very large cities. 7. Personal clouds will hit prosumers’ radar. Nearly 1 in 5 professionals with three or more devices will adopt a personal cloud service for online storage, backup and synching. 8. Video consumption on tablets will more than double in the first six months.Tablets will rule as an explosion of video gets delivered to non-TV devices. 9. HTML5 will cross the enterprise tipping point. Most enterprises will choose HTML5 technologies over native coding for customer-facing mobile applications. 10. More than half of mobile malware signatures will target Android. This will be a marked increase from the 40 percent targeting Android today. 11. North American enterprises will buy into 3G/4G M2M. By 2013, 75 percent of new M2M deployments in North America will use 3G or 4G. 12. Multiple uber-TSMs will emerge–and do battle. As stakeholders vie to own mobile payments, at least one entity–and perhaps many–will emerge to act as a neutral third party or uber-Trusted Service Manager (TSM). 13. At least one U.S. prepaid operator will beat out postpaids on Net Promoter Score (NPS). Straight Talk will surpass postpaid U.S. providers by at least 12 basis points on this critical customer experience metric. 14. Economic woes will contribute to an additional 7 million Europeans switching providers. Average monthly churn will increase to 2.4 percent by year’s end. • The mobile gold rush is global in scale and touches all customers. In the last five years, 2 billion new users joined the mobile revolution. Looking ahead, mobile workers and consumers will embrace tablets, mobile content and personal cloud services. At the infrastructure level, the operator imperative to monetize all-IP networks will drive investment in policy solutions. tablet sales in the Asia-Pacific region will total 20 million this year and reach almost 39 million in 2012, more than 50 percent above the U.S.
• Diameter signaling is taking off. Yankee Group has seen significant request for proposal/request for information (RFP/RFI) activity and expects spending on IP-based Diameter signaling to more than double between 2011 and 2012—growing from U.S.$22 million to U.S.$45 million. And overall, they see the market mushrooming to U.S.$212 million in 2015, for a whopping CAGR of 57.2 percent. • Personal cloud services are hitting the high-growth phase. YG forecasts 17 percent of professionals with three or more devices will adopt a personal cloud service for online storage, backup and synching. services and long-term contracts linked to new smartphone purchases.